Camille Cortet is a French designer based in Amsterdam that recently graduated from Design Academy Eindhoven and admits that nature is one of her biggest inspirations when it comes to fashion. More specifically, she is challenged by the idea of transformation and tries to find the parallelisms between animals and humans. After all, fashion is a game of constant changes, from the way somebody can build his or her proper style and the way this can be adapted in different contexts to the frenetic rhythm that styles and trends come and go. Having in mind the way that animals change their color and skin or the behaviors they use when they want to capture the attention of their love companions, Cortet has created the Transformations project. This includes a series of body-ornaments that are an attempt to adapt animal behaviors to our culture and to create new gestures and new body languages within clothing and ornaments. Part of Camille’s particular interpretation of animal beauty is her Snake&Molting legwear. As Camille points out, our skin ages through cycles of molt in the same way that snakes change their skin when it becomes too old and too rigid. Camille’s legwear is inspired by this transformation since her tights become a second skin, made of a laser cut textile, and are adapted to the shape of the body. This second skin evolves with our movements as it ages and breaks like a skin after several uses. Bird&Seduction accessory collection, on the other hand, is a wearable collection of collars made out of textile and coated paper. This time the main inspiration comes from the birds and their capacity to transform their body with volume and colors during the mating period. 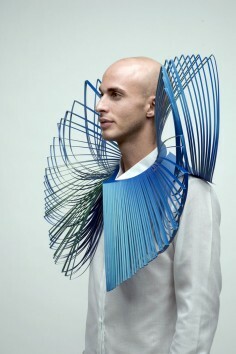 Bird&Seduction collars are made with different layers of textile and coated paper and can be used as body ornaments that one can shape around his body. The peculiarity is that, in concordance with birds’ visual seduction, these paper structures can obtain with the right movement volume and colors just for a moment, a moment to impress. Camille’s quest to create fashion items that reflect the transforming and always impressive essence of nature has certainly wowed us and we are sure that the best is still to come! Nada melhor do que começar o ano com muita inspiração, coisa que não falta nos trabalhos da designer francesa Camille Cortet. Depois estudar profundamente as mudanças de cor e pele pelas quais passam as cobras e os pássaros, a estilista criou a série “Transformations“, que faz parte de seu trabalho de conclusão de curso na Design Academy Eindhoven, na Holanda. Segundo ela, as peças são uma tentativa de adaptar os comportamentos animais com a nossa cultura e criar uma nova linguagem corporal. Com shapes e texturas elaborados, Camille apresenta criações com uma interpretação muito particular sobre a vida humana e animal. Prova disso é Snake & Molting Legwear, uma calça feita com tecido recortado à laser que funciona como uma segunda pele. “É um comportamento animal e uma experiência que eu traduzi para uma roupa, que envelhece e se despedaça como a pele. A pessoa pode escapar de sua calça quando ela fica muito velha”, revelou em seu blog. Já na coleção de acessórios Bird & Seduction, a designer usou tecidos e papéis recortados para criar colares masculinos estruturados. Dessa vez, a inspiração veio dos pássaros e sua capacidade de transformarem o corpo com volumes e cores durante o período de acasalamento. Assim como na natureza, as peças só se armam no momento certo – o momento de impressionar. Imaginée par le jeune designer français Camille Cortet dans le cadre de son diplôme de fin d’études à la Design Acamedy d’Eindhoven, découverte de l’intéressante série « Transformations », une surprenante collection de cravates, plastrons, pantalons et autres vêtements inspirés par le règne animal et plus précisément par les serpents et les oiseaux. Mettant en lumière les similitudes existant entre l’Homme et et l’animal, notamment dans leurs cycles naturels et leurs comportements, découvrez la collection en images dans la suite! Camille Cortet è francese. Ha studiato design a Parigi per poi approdare alla prestigiosa Design Academy di Eindhoven, dalla quale ha iniziato a indagare sull’interessante progetto per cui l’abbiamo chiamata in causa e intervistata. Affascinata dalla cultura animale, ovvero quell’insieme di comportamenti attribuiti a determinate fasi della vita, che si riflettono anche sull’aspetto esteriore, la designer ha studiato e ricercato un linguaggio umano per tradurne la complessità: la moda. Due in particolare, sono i progetti con cui Camille Cortet è riuscita a creare una connessione fra questi due mondi, con l’aiuto di tecnologie avanzate, lo studio di tessuti innovativi e un’indispensabile dose di manualità. Il primo, Bird & Seduction, si esprime in una collezione di accessori ispirati alla regole dell’attrazione tipiche del regno volatile. Il secondo, Snake & Molting Legwear si lega alla variabilità della pelle rettile e consiste in un fuseaux in tessuto elastico effetto squamato, che con il passare del tempo cambia colore e consistenza, per poi spezzarsi. 이번 리포트는 패션디자인 분야의 프랑스 태생으로 암스테르담을 기반으로 활동하는 카밀 코르테(Camille Cortet)의 프로젝트를 소개하고자 합니다. 그녀는 이번 프로젝트를 Transformations(탈바꿈, 변환)이라는 주제로 인간 문화에 동물 행동의 변환을 작품으로 표현하고자 했습니다. 최근 아인트호벤 디자인 아카데미를 졸업한 카밀 코르테(Camille Cortet)는 그녀의 변환 시리즈의 일환으로 문자 그대도 molt(탈피) 뱀가죽 레깅스 한 켤레를 디자인했습니다. 변환 프로젝트는 동물의 행동과 벗은 허물, 새로운 깃털 등의 변화에 관한 연구에서 시작되었습니다. 카밀 코르테(Camille Cortet)는 “나는 내가 동물의 표피를 분석하고, 색상 및 질감과 변형에 대해 살피고 관찰한 연구 끝에 영감을 얻어 디자인했습니다. 제가 신체 장식으로 표현한 우리 자신의 인간 문화의 일부인 패션 디자인으로 가짜 모피, 얼룩말 프린트 등을 사용하는 악세서리를 만드는 결과로 실제로 입은 사람은 동물의 탈피 행동을 경험할 수 있으실거라 생각합니다.” 라고 자신의 디자인에 대한 언급을 했습니다. 그녀가 말한거 처럼 이미지만으로도 그녀가 만든 Snake&Molting 레깅스를 입으면 마치 뱀의 일부가 되어 탈피하는 느낌 들 것 같습니다. 디자이너의 뛰어난 관찰력이 멋진 패션 아이템으로 탄생한 신선한 작품이라고 생각되고 다른 작품에 대한 기대치 또한 높아집니다. 새롭고 더 좋은 카밀 코르테(Camille Cortet)의 작품을 다음번 리포트에 또 다시 소개하고 싶습니다. Transformation é um projeto de Camille Cortet, designer que trabalha em Amsterdan. O objetivo é encontrar novas formas e procedimentos para reinventar objetos vestíveis. Partindo da observação do comportamento animal, os pontos de chegada não poderiam mesmo ser os usuais. Camille Cortet е създателката на тези впечатляващи дизайни на дрехи и аксесоари, част от т. нар. Transformations project. Тя е дизайнер, вдъхновяващ се от природата и по-конкретно от трансформацията и връзката между хората и животните.